3D Printer Adhesive Glue by Layerneer, Bed Weld Original, Strong Grip Reduces Warping for ABS, PLA, and PETG Filament on Heated Build Plates, 4 oz. Do you have trouble with parts warping or coming detached from the printer bed? Have you struggled with part removal after printing is finished? BED WELD was engineered to solve these challenges by enhancing your print surface so that it grabs hold of that critical first layer when your build surface is hot, and refuses to let go with its gecko like grip. In many cases you can often print without rafts or build plate adhesion layers, saving you time and material. Once your part is finished the coating dynamically morphs as your printer bed cools, releasing its hold so you don’t have to wrestle to get your part off. No more chipped glass or broken parts. In most cases, your part will fully detach without the need for tools. In the event the part does remain attached it normally takes just a simple lifting of a corner using the edge of a razor as a lever, and the part easily pops off. 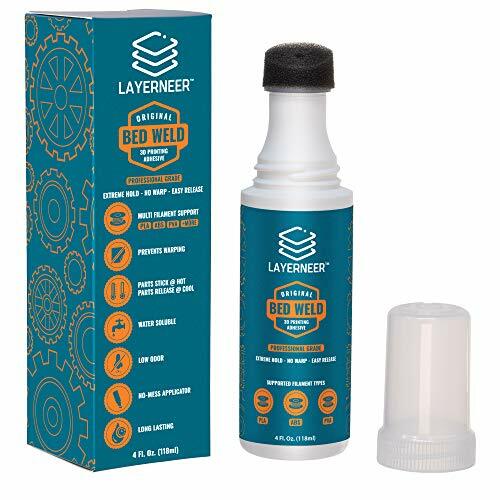 BED WELD comes with a unique built-in applicator that makes applying the coating a simple no mess process. The coating dries quickly to form a thin film that is not sticky, so there is no risk of getting a clogged nozzle or having residue on your finished part. NOTE: The BED WELD coating was designed for use with heated build plates made from glass or aluminum and was optimized to work with PLA, ABS, PETG, PVA, and CPE filament types. Not recommended for use with Nylon, PP, or TPU 95A. See image for compatibility summary. Applying to build plates that have other surface coatings, such as magnetic build plates, or tape, is not recommended. BED WELD is backed by an unconditional 90-Day money back manufacturers guarantee, so you risk nothing!